If you have a four-wheel-drive vehicle, whether you're tooling around in Indianapolis or getting rugged on camping trips, it doesn't take a lot to knock your vehicle out of alignment. Mishaps with curbs, bumpy roads, curbs, or potholes, combined with regular wear and tear can really do a number on your car's steering components and suspension system. When that happens, everything will feel it; your tires, your vehicle, and your hands on the steering wheel. Safety - Your vehicle can pull to the left or the right, undermining your handling and control when your wheels aren't aligned. Comfort - When your wheels are aligned, they are much safer to drive on, and they make driving much easier and enjoyable. Tire Life and Savings - Uneven alignment of your vehicle's suspension system will lead to uneven tire wear, meaning that you'll experience a shorter life expectancy for your tires. Regular alignment will ensure your tires last longer and will save you money. How Can I Tell If My Tires Need Aligning? Your front tires show signs of uneven wear. Your steering wheel doesn't line up straight. Your vehicle pulls to one side. Your front end shakes after hitting a bump. When you drive your vehicle and experience any of these signs, you need to schedule a vehicle alignment performed by a certified technician immediately. Proper alignment requires sophisticated equipment that adheres to the manufacturers' preferred specifications and provides an exact wheel alignment. 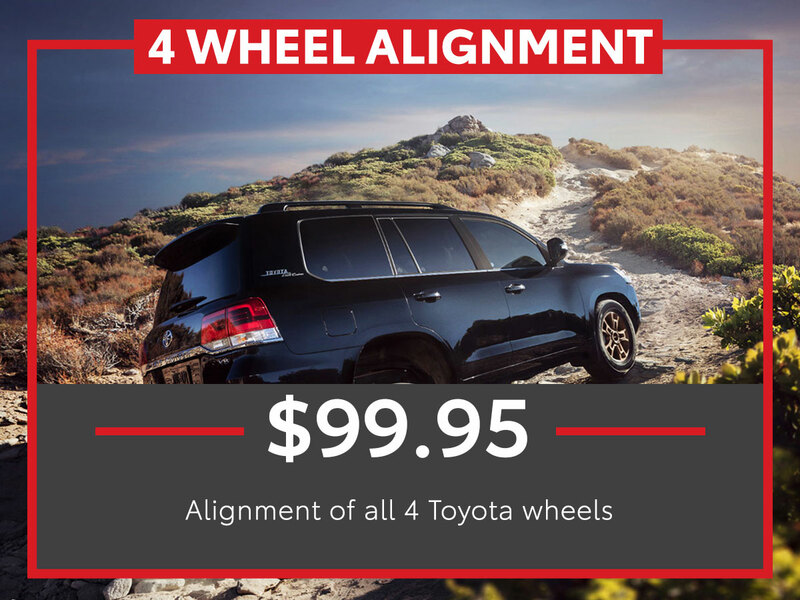 At Tom Wood Toyota our technicians assess your vehicle and perform computer alignments that make sure all four-wheel vehicles are parallel, sitting flat on the road, and your steering wheel is centered. Even if you haven't experienced signs that your vehicle needs an alignment right away, if you haven't brought your vehicle in for regular servicing at Tom Wood Toyota, we recommend that you check your owner's manual find out when the manufacturer recommends alignments. Also, you should have an alignment every time you get a new pair of tires. If you have questions about your vehicle, we have answers at Tom Woods Toyota. For more information about how important four wheel alignment is to the handling of your car, contact Tom Wood Toyota today!